The State of Global Air report brings into one place the latest information on air quality and health for countries around the globe. It is produced annually by the Health Effects Institute and the Institute for Health Metrics and Evaluation’s Global Burden of Disease project as an objective, peer-reviewed source of air quality and health impact patterns and trends for countries around the world. Suggested Citation: Health Effects Institute. 2019. 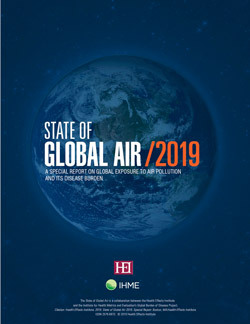 State of Global Air 2019, www.stateofglobalair.org. Find previous reports in the Archives. Find out how air pollution affects life expectancy. The 2019 State of Global Air features an analysis of how much air pollution reduces life expectancy in countries around the world. Learn how air pollution affects risks from type 2 diabetes. In light of recent evidence indicating that air pollution contributes to development of type 2 diabetes, this year’s assessment includes estimates of the health burden related to that disease. Read the Report for more information. As the science continues to advance, the Global Burden of Disease project has incorporated new data and methodology into its air pollution and health assessments. While new methodology may result in differences between assessments from previous years, trends over time are recalculated with each update to ensure the findings are internally consistent within each report. For more details, read the Report. What would you like to see in future reports? Contact us with your feedback!